Follow our 9-week series to learn how to get the best mortgage for your specific financial situation and goals. You’ll learn what do before, during, and after the entire mortgage process to make sure you are getting the right loan product for YOU. This week you will learn about down payment options and how much cash you really need (or don’t need) to get the loan you want. We want to emphasize that a down payment does not have to be a roadblock to homeownership! There are so many options these days that allow you to put less than 20% down and not pay monthly mortgage insurance. We can get you on the right track for what you need to do to make this happen. The amount of your down payment actually depends on the type of mortgage you’ll get. And that depends on your budget, your financial situation, and even the type of home you are considering. That’s why it’s important to talk with several different lenders to go over all the loan programs they offer and to discuss your particular financial situation. Remember, it’s not one-size-fits-all when it comes to mortgages, and you have your own unique needs and requirements. Certain lenders are a better match for you than others, so shop around. You’ll be able to narrow down your own mortgage options, once you’ve determined what sales price correlates to your monthly budget. And that’s why we covered the importance of your monthly budget in Week 2 of our series. After you complete your monthly budget you need to decide how much you want to put down. That way you can find out what your price point should be and what loan programs are best for YOUR specific financial situation. Don’t worry too much about the percentage, just think about how much total cash you want to put towards the purchase, and then the loan program will work itself out based on these first two decisions you make—monthly payment and total cash toward the purchase. And sometimes, the amount of available cash you have for a down payment can direct you to certain loan products or programs. For example, there is a great first-time buyer program, depending on your loan amount, that allows you to put as little as 3% down and not have mortgage insurance. Keep in mind that closing costs usually average about 3% of the purchase price, so you’ll need a little of your cash for that as well. There are pros and cons for each type of mortgage product, and each has its own down payment requirements. Your lender can go over the details for each as it pertains to you. Remember, each lender may offer a different product, and that’s why you should meet with several before you settle with a certain lender. Lenders of conventional loans may require 5, 10 or 20% down, depending on your credit score and other factors affecting your financial picture. There are even 3% down options for some of you. FHA loans can require as little as 3.5% down. But its fees and insurance may increase your monthly payments. If you are a veteran, you can put 0 down with a VA Loan. 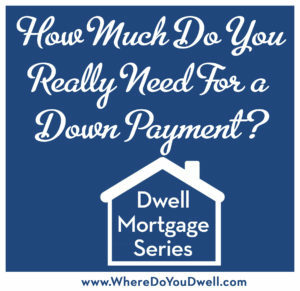 You may qualify for a low down payment assistance program. There are programs out there for moderate-incomes! 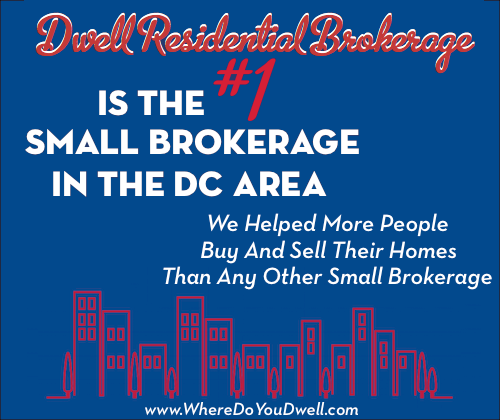 For example, in DC, you can get up to $80,000 in down payment assistance depending on your income. Remember, many buyers don’t have to put 20% down to avoid paying monthly Private Mortgage Insurance (PMI). We’ll cover PMI and ways to avoid it in an upcoming article in our Mortgage Series. You’ll need to consider the possibilities and the financial impact with each loan option. We can help you with that along with your lender. Make sure you understand the correlation between your purchase price, monthly mortgage payments, and down payment. It’s all tied together but can be very different for each home buyer. Don’t compare yourself with friends! How much you can put down and how much you need to borrow can affect what mortgage product and interest rate is available to you. For example, if friends have more to put down, they might be able to buy a more expensive home than you. Or, on the flip side, if they buy a home priced the same as yours but put more down, they could get a better interest rate since the amount they need to borrow is smaller. Your parents and friends may tell you that you need to put 20% down. Although they have the best of intentions, gone are the days of needing so much to buy a home, especially your first home! Yes, a larger down payment will reduce the amount you have to borrow but it might not be the best option for YOU. Makes you fall into the trap of postponing homeownership until “someday” but it’s never today. Saving to have enough money in the bank for a 20% down payment can be daunting and seem unattainable. You’ll end up delaying and delaying and miss out on opportunities that are out there right now. You end up with nothing left in your savings account once you buy a home. Put down just enough to get a monthly payment that works for your budget right now. Never put all of your savings into your home to get to 10% or 20% down. You’re going to need some cash flow for other investments, any emergencies, or the inevitable responsibilities once you’re a homeowner. You have the wrong impression of the lending environment in today’s market. Lenders are more willing to work with buyers since many restrictions on buyers have eased up. That means you’re more likely to be able to buy a home today with less money down and qualify for a mortgage. Also several lenders offer grant programs that help with down payment and closing costs. You don’t realize that you may qualify for a home buyer assistance program. Not knowing about first-time buyer programs from state and local programs can be a huge mistake. You might need to use less savings than you thought. These programs offer down payment assistance (and may cover closing costs) for many moderate-income buyers in DC, VA, or MD so you’ll need less cash. No one should turn down free money, and we can give you all the details about income levels, locations, and more for these programs. Once you narrow down your mortgage options and take into account any homebuyer assistance programs, you’ll have a better idea of how much cash you’ll actually need for your down payment. Withdraw funds from your IRA or Roth IRA. Gift from immediate family of up to $14,000 per year per person. Borrow from family or friends. Lenders will need to know this! Increase you tax refund by changing your withholding exemptions from 1 to zero. Save, save, save. Deposit money in your bank account regularly. Cut back on unnecessary expenses. Do you really need that $5 coffee? Sell stuff on eBay or Craig’s List. Consider a side job to earn some extra money. Stay tuned! Next week, the fourth installment of our “How to Get the Best Mortgage” series will cover the topic, “How Your Credit Impacts Loan Options.” This is important to know and we’ll show you how you can make sure you don’t hurt your score.